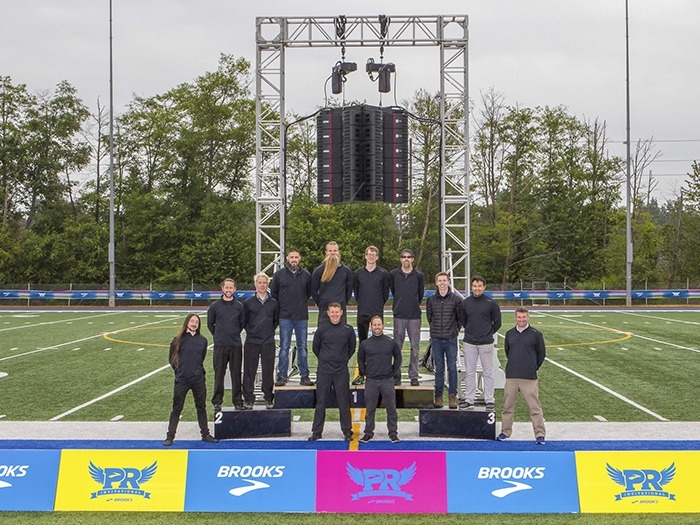 The Service Solution Audio Visual team alongside two EAW Anna arrays hanging side-by-side to provide 180-degrees of coverage for the prestigious track and field event. Service Solutions Audio Visual, Washington, provided an Eastern Acoustic Works (EAW) Adaptive sound reinforcement system to back up Brooks PR Invitational, a running event which draws over 1,500 participants and fans. Cristian and his team hung the Anna arrays from a truss arch that was 20-feet tall, 10-feet wide and located near the 50-yard line. They left-right arrays – each made up of two columns of six Anna – hung side-by-side to provide the clarity and quality the event requires. FOH was located up in the crow’s nest, also at the 50-yard line. Service Solutions AV opened their doors in 2000 as a hotel AV supplier and has grown into one of the larger AV production houses in the northwest, with aspirations to expand further in the future.